The half-way point of the season is here, 5 weeks gone, 5 weeks left to go. We’ve got four weeks left of the regular season, followed by a week of grand finals. 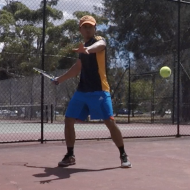 This week’s match of the week goes to Syahaz (pictured) vs Keith in division 1 our Adelaide Tennis League. Syahaz went into this match unbeaten, having won 4 from 4, with Keith yet to get off the mark this season. A great match ensued, with Keith taking Syahaz all the way to the wire. Syahaz finally coming out on top 7-5, 4-6, 6-1. Brilliant match both! Who knows…maybe a rematch in the grand final awaits. Our player of the week this week is Jarrad Braham. Jarrad played 3 matches last week, winning all three and putting himself right back in the mix for a grand final spot. Jarrad hasn’t had it easy, with all three games going the distance! First up he beat Mark 2-6, 6-4, 6-4, he followed this up with a 2-5, 7-6, 6-4 victory vs Renate and finished the week with a 6-7, 6-2, 6-4 win against Mussa. That’s a whole lot of tennis! Great tennis Jarrad and best of luck for the rest of the season! Enjoy week 6 & 7 of the spring season, see you on the court!